"We designed a ring for a customer that contained 4 generations of her family’s diamonds and sapphires. We used the old stones, and added a few new ones, to create a new and updated heirloom that exactly captures her taste and personality." "When we make a custom piece of jewelry, it reflects your vision and desires. It’s your signature piece, never to be duplicated." "For Buffalo AND the world to appreciate"
Creating a custom jewelry design requires equal parts inspiration and perspiration. The inspiration is the result of close collaboration between the client and Barbara Oliver Jewelry. It’s actually a pretty organic process – I sit and listen, ask questions, and make an occasional comment or suggestion when I think you’ll find it helpful. As a Graduate Gemologist with 30 years of experience (since you’re too polite to ask), I will guide you through what may seem like a daunting process. We like to work sitting next to the customer, because counters and desks can impede the creative process. Not to mention that our couches are really, really comfortable. 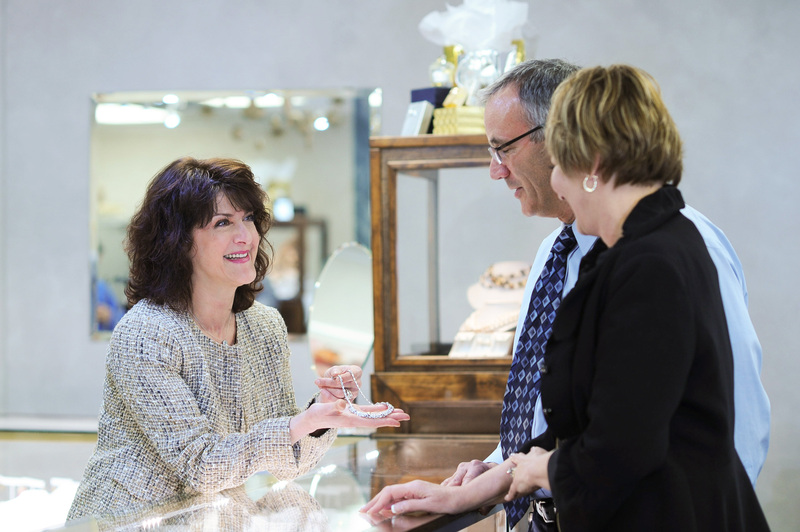 We’ve had more than a few customers liken the experience to “jewelry therapy.” We’re good with that. We’ve created rings for every finger, pendants, earrings, brooches, bracelets and bangles. Sadly we’ve never been given a royal appointment to create a tiara, but we remain hopeful. You may not even know exactly what it is you want, and that’s OK. We’ll serve as your muse, and help you figure out the possibilities with your custom jewelry design. It will be yours alone, and we’ll never duplicate it for someone else. That’s the beauty of doing custom design with us – the finished piece will be as unique and special as the recipient. Most importantly, we’ll strive to make the collaboration a fun and relaxed experience. In the course of our brainstorming we may look at pictures, doodle on a pad of paper, and toss around some ideas. I’ll educate you on stones and metals, and explain in plain language the things you need to know to make informed decisions. I want to understand your taste, your desires, and the significance of the piece. I need to understand how it will be worn, so that the design, settings and metals are well-suited to your lifestyle. If it’s a redesign of one or more existing pieces we’ll discuss the story behind the original stones and pieces. And then, at some point, we’ll have a meeting of the minds, and a fabulous piece of jewelry is conceived. We always respect your budget considerations, and we don’t differentiate based on amount you’ll be spending. We take pride in delivering exceptional value to every customer, and if we make you happy, we get to see you again. Many people are surprised by what we can accomplish with a modest budget. We won’t copy another designer’s work, but we can often accomplish something that has similar design characteristics for less. Sometimes, for much less. Next comes the perspiration, and that part is all on us. It’s our job to sweat the details, and believe me, we do. Of course, you’ll be in the loop from start to finish, and we’ll still need you to go over the detailed CAD renderings and suggest any tweaks. We can e-mail them to you, or we can meet in the office to make sure any questions you have are answered to your satisfaction. It’s all bits and bytes at this point, so making changes to the CAD rendering of your jewelry project is easy. You can also see what the piece will look like when it’s cast and finished; if it’s a ring it is even displayed on a CGI hand (that looks very much like a CGI hand). Once you have tweaked your project to your heart’s content, and you are certain that you have achieved jewelry nirvana; we will make a wax model. For many people the CAD renderings are all they need to proceed to casting, the final step. Some other clients want to see the wax model in order to feel comfortable saying it’s exactly what they want. Either way is fine by us, it’s important that you feel 100% confident that we have captured your vision and are now fully trusted to translate it into precious metals and gems. At the moment when you are ready to proceed, we take a collective deep breath and yell “let’s do this!”; and then we release the wax to our state of the art casting facility. If you would like to have a better understanding of the casting process click here. Then comes the absolute best part – we present the finished piece of art to you. There’s no better feeling than to see and hear the exclamations of delight from a customer when we pop open the box holding their new custom piece of jewelry. Tears and hugs are a frequent side product. We hope you’ll let us share in your own special moments, we’re ready to start when you are. Set up an appointment to see what we can do for you.